Dogs may be known as man’s best friend but they are also the cleaner’s worst enemy. Shedding is a healthy process because it allows your pet to get rid of some of its old, dead fur and to make room for new fur to grow in. Unfortunately this means that your dog’s hair will wind up everywhere and it can be very difficult to clean. One way to reduce the mess that shedding causes is to regularly brush your dog. Brushing sessions also provide a good opportunity to check your pet for illnesses or other problems such as ticks, making brushing a win/win. Brushes for dogs come in all shapes, sizes, materials, and uses. The length and texture of your dog’s fur, as well as the part of the dog that you are brushing makes a big difference in determining the type of brush to use. Making sure that you select the right brush for the job is essential to for reducing shedding and making your pet’s coat look the best that it can. heir fine bristling makes this type of brush ideal for removing difficult tangles or knots. Small slicker brushes can be useful for more sensitive areas such as the face, paws, and legs, making this a versatile tool. Because of their fine bristles some dogs can find this type of brush irritating. For this reason some slicker brushes have tips on the end of their bristles. This is an important feature if your pet has sensitive skin. These are heavy duty tools used for dogs who have coarse, thick coats of fur such as the Afghan, German Shepherd, or Schnauzer. 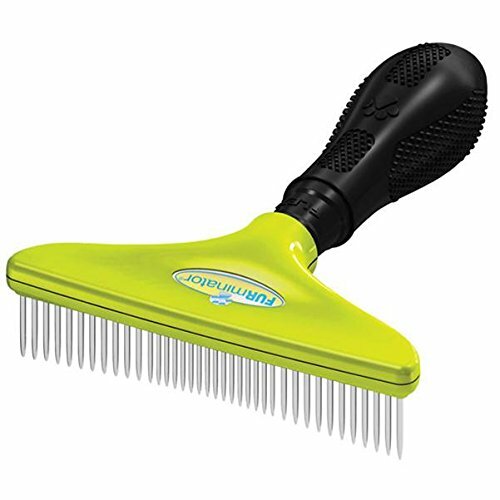 It is important to be careful with this type of comb because they can be very rough and irritate your pet’s skin. Some companies offer combs with rounded tips, making them more comfortable for your dog. One of the benefits of this type of comb is that it can reach the inner coat of fur, even if your dog has a thick overcoat, making it easy to remove knots and dead hair. These combs are often combined with slicker brushes which are more suited for brushing the outer coat. Pin brushes look like an oval pin holder with a handle attached. The pins have rounded heads to ensure comfort for your pet and they are somewhat flexible to prevent them from breaking if they get caught in a knot in her fur. These brushes are best suited for dogs with curlier coats of hair. Using long strokes ensures that you remove any dead hair and keep your pet looking her best. Also known as a curry brush, these are often used to keep your dog’s fur clean, especially after he’s been outside to play. Running a rubber brush over your dog’s fur removes dirt and grime and helps to spread oils over the fur, keeping it looking sleek and shiny. Curry combs are great for use on the ears, paws, and tail, though you need to take care to not be too rough with the comb. It is very important to note that you should never use a metal curry comb on your pet. 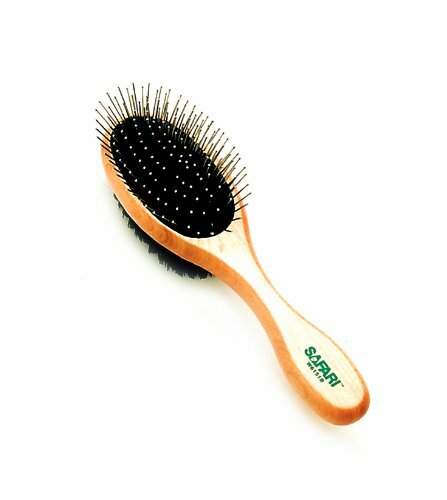 Metal curry combs are designed for removing fur that has become tangled in other brushes. Rubber curry combs are designed for use on your pet’s fur. These versatile brushes are suited for use on nearly any texture of coat though the spacing of the bristles will determine whether it is better suited to long or short fur. Short bristles that are closely spaced are suitable for shorter fur while longer bristles with larger spacing are best fur long haired breeds. 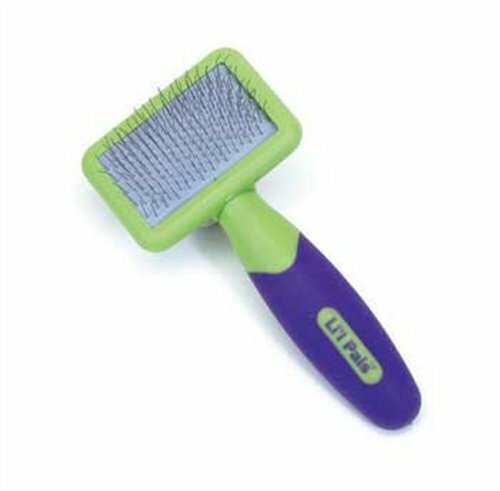 Bristle brushes are similar to rubber brushes in that they are effective at removing dirt from your pet’s fur. Often, groomers use bristle brushes after they have gone through the dog’s coat with a different type of brush. This final pass removes any stray fur that has collected on the top of your pet’s coat and spreads natural oils. Combs with wider teeth are great for pets with sensitive skin. They work to remove knots, dirt, and dead hair much more gently than combs or brushes with finer teeth but can also be more easily broken, making a gentle hand imperative. Brushing your dog seems like a simple process but a few simple tips can make it a much easier experience. The type of brushes used is determined by length and texture of your dog’s coat but the basic idea is the same. · Start by brushing your dog to remove the dirt from the outer layer of her fur. Next use a hardier brush to remove knots and tangles of dead hair from her fur. Make sure to brush all of her fur, including the legs, feet, and tail. Finally finish with a brush that will smooth out her fur and make it look sleek. 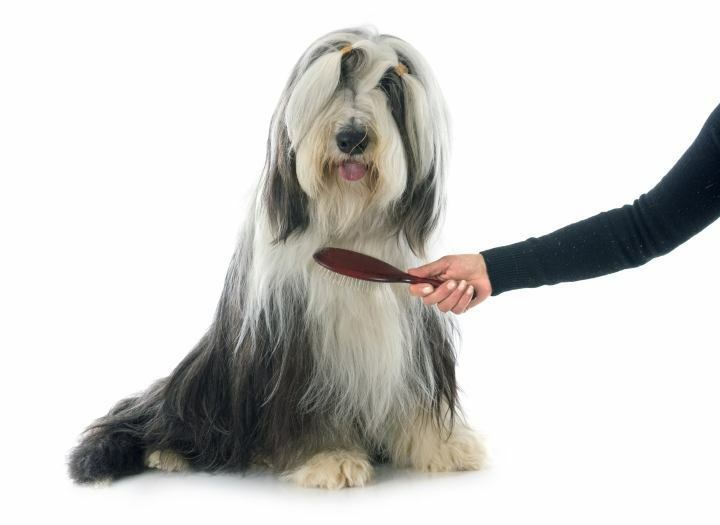 This simple process will make brushing your pet a breeze and keep her looking the best that she can. 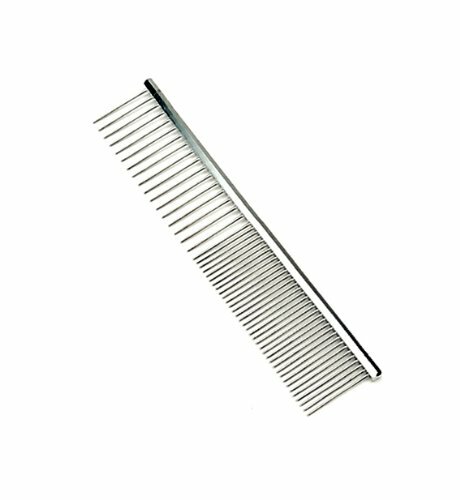 This basic metal comb is best suited for larger breeds that have thicker coats of fur. It features rounded teeth which make it good for pets that have sensitive skin. Each half of the comb has a different spacing between the teeth making it more versatile than a comb with one level of spacing. This also makes it usable with smaller dog breeds, even if it is intended for use with larger breeds such as German Shepherds or English Sheepdog. Its metal design makes it durable enough for long term daily use. This pin brush comes with a durable wood handle to make it ergonomic and easy to use on larger breeds that require lengthy brushing sessions. It is best suited for use with dogs that have curlier coats of hair though it is useful for smoothing out the coats of any dog. The pins have coated heads at the end to prevent it from irritating your dog’s skin, though this also prevents it from penetrating to deeper parts of your pet’s fur. This means that you’ll need a different comb or brush for that. If you are looking for a good, cheap brush for your curly haired dog, this is a solid choice. This tool is specially designed to reduce shedding and remove knots from your dog’s fur. It features a shatter resistant handle and metal comb making it incredibly durable. It is suitable for use with any size dog and any type of fur making it one of the most versatile brushes on the market. It is designed to be non-irritating to your pet’s skin, but make sure to take breaks from brushing the same area if you find a knot that is difficult to remove. The comb head is detachable making it easy to store, even in cramped areas like a car glove box, in case you want to bring on with you on trips. 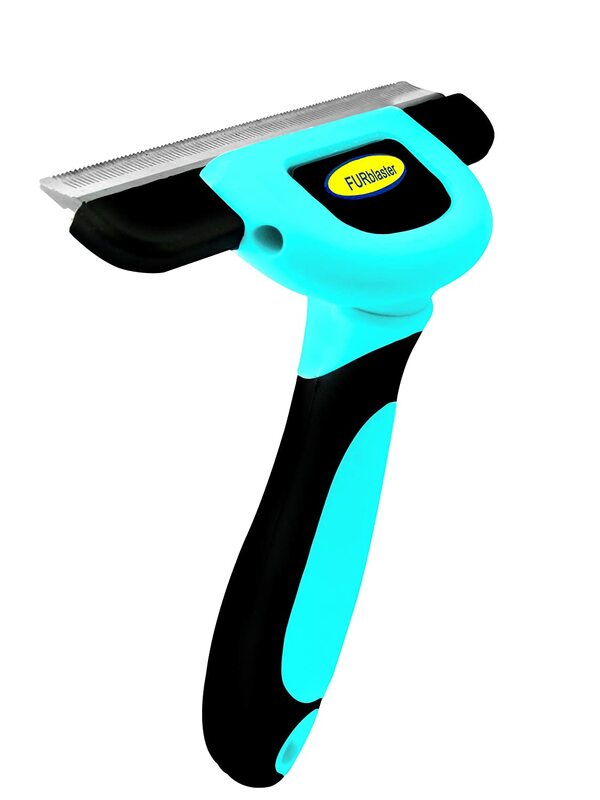 If you want a premium, all in one tool to brush your dog and reduce shedding, the Furblaster fits the bill. Like the Furblaster the FURminator is an all-purpose tool that reduces shedding and removes tangles and knots from your pet’s fur. Its metal teeth have rounded ends to prevent irritation and its textured handle makes it easy to grip and use. The plastic head is designed to be anti-microbial to reduce the chance of transmitting germs if you use it on multiple pets and it is designed to follow the contours of your dog’s body making it even more effective. This is another premium all in one tool, which one you prefer is a matter of personal preference. This slicker brush is, as the brand name implies, designed for smaller toy breeds or puppies. Its fine bristles are tipped to reduce the irritation that is commonly caused by slicker brushes, giving it a step up on the competition. The pins do not compromise the ability of the brush to penetrate thicker coats making it a great choice for pets that have coarse fur but sensitive skin. Its size also makes it useful for the detail work on bigger breeds paws, tails, and face, giving it some versatility. If you have a small dog with lots of fur and sensitive skin, this is brush would be a solid choice.